Glass tile in Denver is increasingly appearing in the living and family rooms of the region. Replacement solutions for increasingly limited wood burning fireplaces, inserts, and stoves, are presenting opportunities to reinterpret the traditional hearth. Many Denver area designers and homeowners have turned to electrical fireplaces in both new construction and remodeling projects to replace the old wood burner, while not having to totally repurpose the fireplace area. While many natural gas and liquid propane fireplaces and inserts strive to present a decent illusion of a wood fueled fire, electrical ones present only the suggestion of an actual fire burning within. Many creative homeowners and designers have embraced the visual difference and successfully augment the contrast of it. Modern electrical fireplaces, complete with remote control technology, offer the ability to shift the colors of their light bulb created flame illusion, offering hues ranging from blue, through purple, to orange, or any blend among its settings. Some units even project ambient light to the surround. Because these units all are cool to the touch, they don’t threaten to heat up nearby glass tile or affect the installation in any way. The standard electrical fireplace installation is a direct insert into the wall. However, this option leaves many with the impression of an oddly located television, as these appliances appear as a blackened screen when deactivated. This has led many designers and homeowners to get creative about the surround to reinforce that it is a heat source. 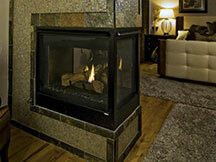 Glass tile, like we offer at PetraSlate of Denver, can be used to create the latest in electric fireplace surrounds. Most of the contemporary electrical fireplaces available come in a wide rectilinear form that announces themselves as not the fireplaces of yesteryear. Some designers use large glass tiles in Denver to suggest a futuristic sort of chimney. This creates an impressionistic chimney space of raised tile from the top of the electrical fireplace unit to the ceiling. For those who would find that amount of unrelieved glass tile undesirable, another trend is to put up rows of the smaller 1”x 1” glass tiles to create a fairly narrow total surround that is used to make darkened electric fireplace not look like a deactivated television. Petraslate is ever increasing its selection of glass tile in Denver to accommodate the creative uses designers and architects have found for this versatile and eye catching product line. Contact PetraSlate Tile & Stone today to see what we have in stock, and what we can source.